A workers’ strike came to an end on Sunday when employees of one of the largest gold mining companies Harmony Gold accepted a proposed wage increase offer. In the latest labour dispute, wage negotiations between the National Union of Mineworkers (NUM) – which represents more than 60 per cent of the 140,000 gold workers – and their employer companies broke down in August despite appeals from South African President Jacob Zuma for peaceful wage negotiations. On September 3, Gold mining companies, AngloGold Ashanti, Gold Fields, Rand Uranium, Harmony Gold, Evander Gold, Sibanye Gold, and Village Main Reef, offered a basic increase of 6.5 per cent for category four and five employees, including rock drill operators. The offer was rejected and tens of thousands of South African gold miners went on strike. But most of those on strike – such as the gold miners at AngloGold Ashanti and Sibanye Gold – went back to work on September 6 when the wage increase was agreed between 7.5 and 8 per cent. Workers at Harmony’s mines in the central Free State and Northern Cape provinces had initially held out for a better deal, but the company announced that they had now accepted. “Members of the NUM (National Union of Mineworkers) have accepted the same offer made by other producers in the industry, and have returned to work,” Harmony Gold said in a statement distributed to the media. Meanwhile, workers in South Africa’s automotive industry announced on Sunday that they will end a three-week strike and return to work after accepting another wage increase offer from the leading car manufacturers. The new wage regimen includes an 11.5 per cent increase for this year, 10 per cent next year and 10 per cent in 2015. “We are officially announcing the end of the nationwide strike and hope our members will go back to work tomorrow,” National Union of Metalworkers of South Africa, or Numsa, Secretary General Irvin Jim told reporters in Johannesburg today. The economy first took a hit when some 30,000 automotive industry workers walked off their jobs in protest against low wages on August 19. The automotive industry, currently home to major companies such as Toyota, Nissan and Volkswagen among others, produces nearly 280,000 vehicles a year and accounts for six to seven per cent of the country’s economy. 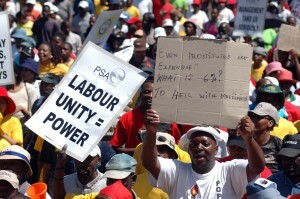 The automotive strike was costing the South African economy up to $70 million a day. Protests for better quality of life have plagued successive South African governments since the end of Apartheid with some saying not much has improved for the majority black labour force. The increasing eagerness of the recent strikes demanding higher wages has been a thorn in Zuma’s side for the past two years and could pose a threat to his African National Congress (ANC) at the ballot box next year.